Our new Constructionline accreditation demonstrates JWS Waste’s commitment to supporting the construction industry. Construction companies can be confident that the services JWS provide are of a high standard and are also environmentally sound. 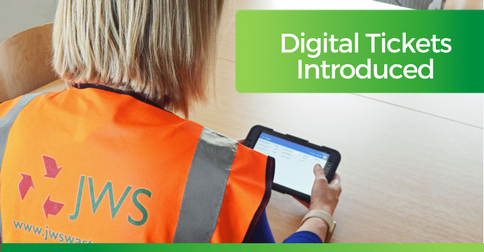 JWS have gone digital with new driver handheld devices. Fully integrated with our own waste management system, these devices have officially replaced paper tickets in favour of a digital version that lands right in our customer’s inboxes.